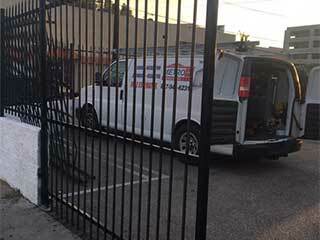 Our company offers gate repair services as well as garage door maintenance. We can fix all kinds of residential or commercial gates. From all designs of swing and sliding gates, we have the expertise to fix whatever malfunction you face. Need your cast iron gates along with any metal part welded? Our most experienced technicians can tackle any welding repairs needed to get your gate up and running like new. It can be common for swing gates to become unbalanced over time or for sliding gates to get jammed. We can offer full repair and troubleshooting to ensure you are left with a fully functioning gate that meets all your daily needs. Have an urgent gate issue that needs immediate attention? We can send help over right away if you live within our area of operation. We focus on giving local customers the best response times, rates and quality service. We bring all of the parts and tools needed to have your driveway or commercial gate fixed the same day you call. Gate repair and installation can be an incredibly dangerous task to undertake alone. Many modern gates come with automatic gate openers and devices that take significant expertise to set up properly. We have experience successfully installing a huge range of gate designs and will certainly be able to ensure that yours is working perfectly and ready to last for years of flawless performance. Want help right away? Contact our team now and one of our friendly customer service staff will be happy to help you with any information you need or to make a booking. We can arrange a visit at a time that suits you and advise on the best options to meet your needs. Contact Garage Door Repair San Marcos now for help with your particular gate concern!